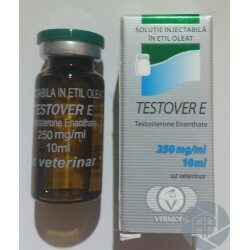 Testover E Vermodje is an oil based injectable steroid. It is designed to release testosterone slowly from the injection site. After administration, serum concentrations of this compound will rise for several days, and remain markedly elevated for approximately two weeks. Becouse of that bodybuilders and athletes call him Testosterone depo. It is strong anabolic steroid that can build solid muscle mass and great strength for short time. Testosterone enanthate Veromdje is a powerful steroid, but you must be careful. It has high anabolic action, but also has strong androgenic effect. Testover-E Veromdje will develop and rapidly increase muscle mass and your strength. It increases physical ability, activity and provides over recovery. You will feel that the time for sleep decreases and your body can more quickly be recover. But along with the good things you can expect and side effects as a result of moderate aromatization of testosterone. You will notice slightly puffy appearance due to increased water retention, hypertension (as a result of swelling) and increased risk of gynecomastia. This soft and bloated appearance that is usually objectionable to most consumers, and the risk of gynecomastia, can be avoided with the use of an aromatase inhibitor (eg, Arimidex) to disable the enzyme aromatase converts testosterone into estrogen. Thus, the muscles will stay firm without soft puffiness. Thus, Testosterone can be successfully used for "curing" or cycle for relief. Taking high doses can lead to estrogenic side effects, such as acne and gynecomastia. The excess estrogen level during/after your cycle also has the potential to lead up to gynecomastia. Adding an ancillary drugs like Nolvadex and / or Proviron is therefore advisable to those with a known sensitivity to this side effect. Although Testover E is active for a long duration, most fitness athletes prefer to inject it on a weekly basis in order to keep blood levels more uniform. The usual dosage would be in the range of 250 mg - 750 mg. This dose is quite sufficient, and should provide the user a rapid gain of strength and body weight. Above this level estrogenic side effects will no doubt become much more pronounced. Those looking for greater bulk would be better served by adding an oral steroids, like Anapolon or Dianabol. The classic combination for bulking cycle for muscle mass is Testosterone enanthate, Deca durabolin and Dianabol..
After using this compound you should be done post cycle therapy (PCT) with Pregnyl (HCG) and Clomid. This will avoid unwanted side effects of increased estrogen levels and will restore testosterone production more quickly, also you'll be able to keep acquired muscle mass.